Get your complimentary white paper now! Connect for Success: The Critical Relationship Between Talent Acquisition and Succession Planning outlines how best to break down the silos of these interdependent core HR functions inside your company. 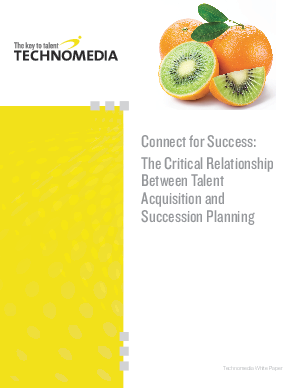 It offers practical guidance on growing your talent to alleviate succession risk, how to retain and motivate your high potentials, as well as the important connection they have together to leverage your talent management initiatives for stronger business results.